When you get home from work, take a full 5 minutes to connect and love on your pet. Right after you take off your shoes, greet your pet with a loving cuddle or hug and tell them about your day. Even hearing your voice is soothing and beneficial to your relationship and will let them know you love them. On your way home, think of 2-3 highlights that you want to share with them. This is a great way for you to appreciate and analyze your day for positive moments instead of dwelling on anything negative that may have happened. You can also use this time to vent to your pet and use them as a listening ear about the struggles you may have faced. Make sure you are directing your conversation to your animal, dogs in particular love eye contact, and not to the room in general. This will guarantee that your pet feels connected to you and feels needed by you. Also, be aware of the personality of your pet. Some animals, such as dogs, need more physical connection with you whereas cats might only need simple affirmation like a quick pet and a loving conversation. Even small animals like hamsters or guinea pigs will benefit from this time of conversation and connection. Play is a very important part of every animal’s day. Play needs might vary based on species or temperament but for the most part, every animal has a way to play with you. It can be hard to find time to take your dog out for an hour every day or spend time on the floor playing with your cat all night, but setting aside a certain time during the day or night that is designated “play time” will help establish a routine that your pet can depend on every day. Whether you do it first thing in the morning or later in the evening, set a time that will be uninterrupted playtime for you and your pet. It doesn’t need to be longer than 15 minutes, and you can even set a timer if that helps you manage your day. But if you do this daily, you will find that your pet recognizes the effort you are making and will look forward to this time every day. This can even be an opportunity for you to play with your children and help them understand how to play nicely with their animals so that they can also connect and establish trust with their own pets. At the end of the day, we all want to have some time to ourselves. We all need time to slow down and process the day, whether it be by watching TV, reading a book, or sitting down to get some leftover work done. This is a perfect time to show affection to your pet. Let them sit or lay near you in a way that won’t be bothersome to either of you. Give them the type of physical love they need, through petting, scratching, or just letting them lay on you. Through hardly any work on your part, and by simply allowing your pet to be near you, you are communicating to them that you want them around. If you have primarily, or exclusively, outdoor pets, try to pick a few nights a week that you can sit outside with them and enjoy their quiet company. Be sure not to confuse this time with play time, because allowing your pet to wind down with you also sets up a nice routine that they can count on. It is also a great way for you to slow down and appreciate the day. Sometimes stepping outside and enjoying the breeze is just what we need to remind us of what really matters. Our pets have a great way of reminding us of that also. Lastly, while we never want to bribe our pets into loving us, treats are a great way to show your pet that you love them. It should always be done in a healthy and beneficial way, and most definitely not every day, but even a special bone for your dog or a different kind of lettuce for your rabbit can speak multitudes to them. 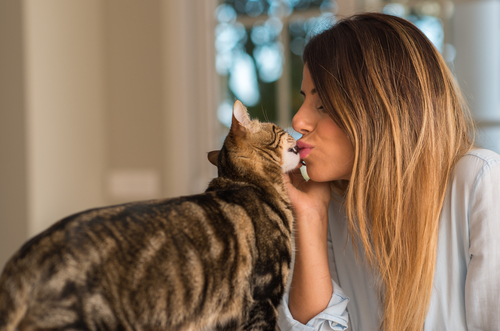 It should never be the first thing you do to connect with your pet, but every now and then you can use treats to reinforce the relationship that you have already established. Treats don’t even have to be food related; you can also get them a new toy, take them to a special park, or set up a play date with another pet. Think of a treat as a special opportunity for you to communicate love to your pet. By doing these 4 things, you will create a bond between you and your pet that will be beneficial not only for them, but for you as well.